Download a diagram of the female muscle diagram to help you see where each muscle is located. Abductor muscle (ab – duhk – ter) A muscle which draws a limb away from the median plane of the body. Abs or abdominals (ab – dom – uh – nl) The abdominal muscles are a group of 6 muscles that extend from various places on the ribs to various places on the pelvis. They provide movement and support to the trunk, often called the core. They also assist in the breathing process. Adductor muscle (uh – duhk – ter) A muscle which brings a part of the anatomy closer to the median plane of the body. Aerobic (ai – roh – bik) Requiring the presence of air or oxygen. Bis or biceps (bahy – seps) A flexor muscle located in the front of the upper arm and assisting in bending the arm. Cuffs or Rotators Cuffs (roh – ta – tor) A bandlike structure encircling and supporting the shoulder joint, formed by four muscles attached and merging with the joint capsule. Glutes or gluteous maximus (gloo – te – us mak – suh – muhs) The broad, thick, outermost muscle of the buttocks, involved in the rotation and extension of the thigh. The largest muscle in the body. Hams or hamstrings (ham – strings) Refers to one of the three posterior thigh muscles, or to the tendons that make up the borders of the space behind the knee. Lats or latissimus dorsi (luh – tis – uh – muhs dawr – sahy) A broad, flat muscle on each side of the midback, the action of which draws the arm backwards and downward and rotates the front of the arm toward the body. Obliques (oh – bleek) The external oblique muscles of the abdomen functions to pull the chest downwards and compress the abdominal cavity. When the internal oblique contracts it compresses the organs of the abdomen, pushing them up into the diaphragm. Its contraction also rotates and side-bends the trunk by pulling the rib cage and midline towards the hip and lower back. Pecs or pectorals (pek – ter – uhl) A thick, fan-shaped muscle, situated at the chest (anterior) of the body. It makes up the bulk of the chest muscles in the male and lies under the breast in the female. Quads or quadriceps (kwod – ruh – seps) A large muscle group that includes the four prevailing muscles in the front of the thigh, the action of which extends the leg or bends the hip joint. Traps or trapezius (truh – pee – zee – uhs) A broad, flat muscle on each side of the upper and back part of the neck, shoulders and back, the action of which raises, or rotates, or draws back the shoulders, and pulls the head backwards or to one side. Tris or triceps (trahy – seps) A muscle having three heads or points of origin, especially the muscle on the back of the arm, the action of which straightens the elbow. Vertifirm™ (ver – ti – firm) – “vertical firmness” – Standing up floor exercises allowing you the benefit of working more than one muscle group at a time by adding upper body resistance training. 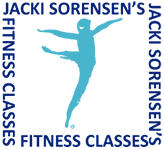 “I can’t imagine not going to Jacki’s Dance as well as the StrongStep classes. I aim for five times a week and work my schedule around class time. Jacki’s programs deliver – added to the happy group aura, I’ve lost weight, and a dress size. I elevate my heart rate, relax in the movement and music and revel in my memory stimulation which accentuates the positive. Jacki’s programs have it all, and for the long haul.